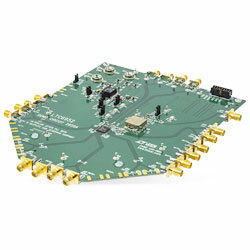 Analog Devices DC2609A Demo Board is a demonstration and evaluation platform for the LTC6952, an ultralow jitter, 4.5GHz PLL with 11 Outputs and JESD204B Support. By default, the board is powered from two supplies. The 9V to 12V supply input powers the onboard reference and VCO circuitry, along with the LTC6952 5V supply pin. The 4V to 6V supply input powers the device’s 3.3V supply pins. A reduced power option is offered that enables the LTC6952’s output supply pins to connect to an LTC Silent Switcher and the input supply pins to connect to a low noise LDO. All differential inputs and six of the differential outputs are populated with 0.5″ spaced SMA connectors. These outputs are AC-coupled with 50Ohm transmission lines making them ideal for driving 50Ohm impedance instruments. The other five differential outputs are terminated with 100Ohm. The LTC6952’s EZSync and SYSREF request functions are made accessible via the board’s SPI interface or the EZS_SRQ SMA/turret connectors. The SMA placement was created for ease of connection for all multi-part synchronisation and SYSREF request modes. The VTUNE and VCO SMAs can mate directly with the DC2664A VCO rider board. This option provides a quick method to evaluate multiple voltage-controlled oscillators. A DC2026 USB Serial Controller Bboard is used for SPI communication with the LTC6952, controlled by the supplied LTC6952Wizard software.